Citizen of Potawatomi Nation is a federally recognized tribe of Potawatomi people headquartered in Shawnee, Oklahoma with tribal jurisdiction in Cleveland and Pottawatomie counties. Their tribal jurisdiction is bound by the North Canadian River, the South Canadian River, the Pottawatomie-Seminole county boundary, and the Indian Meridian. Their three-branch government leadership consists of a three-person Executive Committee and a 16-person legislature which represents over 30,000 enrolled tribal members. The Citizen Potawatomi originally occupied the Great Lakes region of the United States. Originally, the Potawatomi were part of the Three Fires Council, known as Anishnabek peoples, collectively made up of the Potawatomi, Ojibwe, and Odawa. By the end of the 18th century, tribal villages were being displaced by white settlements. Beginning in 1789, through a series of treaties, their tribal land which equaled more than eighty-nine million acres gradually reduced in size. This continued as the federal government continued to remove them from their land to smaller reserves in Iowa, Missouri, and finally Kansas in 1846. By 1861, as the result of treaty, the Potawatomi in Kansas was officially divided. The treaty required its signers to surrender their tribal membership and adopt U.S. citizenship, in-turn creating the foundation for the Citizen Potawatomi Nation. It was a decision that forever shaped the culture and lives of our people and subsequently led to their eventual removal to Indian Territory [Oklahoma]. By the early 1870s, most of the Citizen Potawatomi had resettled in Indian Territory, forming several communities near present-day Shawnee, Oklahoma, where they are now headquartered. Today, the Citizen Potawatomi Nation is a thriving nation that is actively working to preserve its culture while being a frontrunner in Native American business. The Citizen Potawatomi Nation also offers many services to its citizens and to other Native Americans throughout its tribal jurisdiction. These services include: Housing, Community, Education, Health, Veterans, Elder and Career Services. The Citizen Potawatomi Nation is able to provide these and other services through federal funding, grants and tribal revenue to tribal and community citizens who need them most. For example, in 2011 alone, Citizen Potawatomi Nation clinics had more than 62,000 patient visits, filled more than 1530,000 prescriptions, served more than 14,000 meals to the elderly, served nearly 3,000 families through Indian Child Welfare and provided 3,100 scholarships. The Citizen Potawatomi Nation is the successor apparent to the Mission Band of Potawatomi Indians, located originally in the Wabash River valley of Indiana. With the Indian Removal Act after the 1833 Treaty of Chicago, the Mission Band was forced to march to a new reserve in Kansas. Of the 850 Potawatomi people forced to move, more than 40 died along the way. The event is known in Potawatomi history as the Potawatomi Trail of Death. In Kansas, the Mission Band of Potawatomi lived on a small reserve with the Prairie Band Potawatomi Nation. The Prairie Band had adapted to the Plains culture but the Mission Band remained steadfast to the Woodlands culture. Both cultural groups exhibited very different ceremonial and subsistence strategies, yet were forced to share the land. Seeking a better opportunity for its people, the Mission Band leaders chose to take small farms rather than live together with the Prairie Band. Shortly thereafter, and not fully understanding the tax system, most of the new individual allotments of land passed out of Mission Band ownership and into that of white settlers and traders. In 1867, Mission Potawatomi members signed a treaty selling their Kansas lands in order to purchase lands in Indian Territory with the proceeds. To reinforce the new land purchase and learning from their Kansas experience, tribal members took U.S. citizenship. From that time on, they became known as the Citizen Potawatomi. By the early 1870s, most of the Citizen Potawatomi had resettled in Indian Territory, present-day Oklahoma, forming several communities near present-day Shawnee. In 1890, the Citizen Potawatomi participated, unwillingly, in the allotment process implemented through the Dawes Act of 1887. With this Act, the Citizen Potawatomi people were forced to accept individual allotments again. In the Land Run of 1891, the remainder of the Potawatomi reservation in Oklahoma was opened up to non-Indian settlement, with the result that about 450 square miles (1,200 km2) of the reservation was given away by the government to settlers. 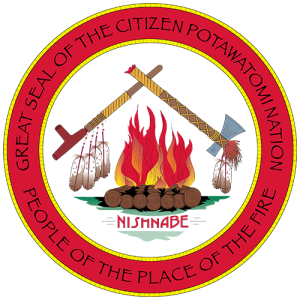 Citizens of Potawatomi Nation is headquartered in Shawnee, Oklahoma with tribal jurisdiction in Cleveland and Pottawatomie counties. Their tribal jurisdiction is bound by the North Canadian River, the South Canadian River, the Pottawatomie-Seminole county boundary, and the Indian Meridian. Bodewadmimwen Department nedwendamen gode bmadzejek abjetowat mine kiktowat ode zheshmowen. Ge ninan nedwendemak wje nigan igwan megwa bmadzejek bwa zégzewat eneshnabemwat. Gzhetomen bkan diyownen bgesh kche medagwendemwat abjetowat gi kkendasjek. Gkenomagemen “fun” mine bkan kenomagewenen wje bkan bmadzejek. Kekyajek, bmadzejek, penojeyek. Bmadzejek da kkendasok ode zheshmowen gishpen wase edawat anake bokshkawat. Gkiktomen ode zheshmowen pene she shena ebmoseyak ode widoktadwen. Widmoyak Bodewadmik wenek gishpen abjetowat mine neshnabemwat. Gnebyegemen mine gmesnatekkemen jayek gode nbwakawat ode zheshmowen iw se gode penojeyek bwa dbeshkawat wa je kendemwat ode Bodéwadmimwen. Nedwendamen mno widoktadwen mneto mi sa bmadzejek nedwendemwat ekendaswat da kkendaswat ode zheshmowen. The Potawatomi language department wants for people to use and speak this language. We want more people as we head into the future to not be afraid to speak Potawatomi. We develop different tools which we hope students will like and use. We hold classes which are fun and work with a variety of ages of students. People can learn the language if they live far away or have monetary limitations. We speak the Potawatomi language in our community. We encourage members to learn and use their language. We record and document all speakers in order to have this knowledge available for future generations. We want a good community spirit in order so that people who want to learn can learn. They operate a truck stop, two gas stations, two smoke shops, a bingo hall, two tribal casinos, FireLake Discount Foods in Shawnee, FireLake Golf Course, and First National Bank and Trust, with two locations in Shawnee, one in Holdenville, two in Lawton, and three in communities surrounding Lawton. Their estimated economic impact is $422.4 million.